June 29, 2018 Robert W.
Custom realtor signs are available in Las Vegas for real estate agents wanting to set themselves apart from other agents. Realtors can make custom real estate signs in many different colors and sizes. Realty agents are moving away from the standard .040 aluminum 18″ x 24″ signs and making real estate signs of different sizes like a 20″ x 30″ and 2ft x 2ft to get their name and properties noticed. Custom realtor signs are also available for commercial listings as well. Commercial real estate signs can be a variety of sizes and shapes. The most common sizes for commercial realtor signs is the 4ft x 4ft, 4ft x 6ft and 4ft x 8ft. These signs are large enough to contain much information about a property such as zoning, utilities available, realtor contact information, pricing, and other pertinent information regarding the property. The cost of these signs vary according to the materials used. For example, a 4ft x 4ft aluminum double sided dibond panel cost slightly under $100 , while the same sign with MDO wood costs around $225.00. ( the difference being in the costs of the substrates used) Both substrates are made to withstand the elements of nature in Las Vegas and are long lasting. They both use a vinyl print that can be any color or combination of colors and then laminated for protection of the print. These signs are designed to last a few years in the hot summer sun of Las Vegas and more depending if they face the sun at its peak time of the day. Las Vegas custom realtor signs are available at many sign companies in the Las Vegas area. Some of these sign companies are Member Benefit Partners with the GLVAR ( Greater Las Vegas Association of Realtors) and offer a discount to real estate agents belonging to the GLVAR organization. Custom printed table covers are very popular with vendors who are displaying at events and shows in Las Vegas. There are many shows and events in Las Vegas that occur weekly because everyone wants to come to Las Vegas for business and pleasure. Custom printed table covers are great for those 6ft and 8ft tables at convention and trade shows. These tables are usually located at the beginning of a vendors booth and a custom printed table covers allows for easy identification of your booth by allowing people to see your name right up front. Custom printed table covers are three sided, but can also be 4 sided if you would like the backside draped over. The polyester fabric is machine washable so that you can use it over and over again at many shows. The custom printed table covers also can be printed in any color ( and also multiple colors) and include logos and pictures of products. The table covers require no special set up as it is so simple and when packed, it takes up very little space. These custom printed table covers cost just over $100.00 and can be ready in just a few days. Custom printed table covers is just one piece of the puzzle for your graphic displays at events and shows. By placing a couple of banner stands and a backdrop banner in the back of your display booth, you can have a professional looking display for a low cost. There are many sign companies in Las Vegas willing to assist you in your design layout of your booth to make sure you have the right graphic displays. These sign shops, like Posterhead, https://www.alignable.com/las-vegas-nv/posterhead-signs are usually located near the convention corridor in Las Vegas and offer delivery services to the event venues as well for a nominal deliver fee. June 27, 2018 Robert W.
Cheap wood realtor signs are a blessing for those realtors that sale or lease vacant land and commercial properties. Cheap wood realtor signs are made with 1/2 ” thick MDO board ( MDO stands for Medium Density Overlay panel ). These wood panels are long lasting and able to withstand the weather in climates like Las Vegas where you have wind, extreme heat, rain, etc. In addition, because of the thickness of the MDO wood signs, they are heavy and add strength against the wind in Las Vegas which can be very rough at times. Cheap wood realtor signs are usually 4 feet by 4 feet, 4 feet by 6 feet or 4ft x 8 feet in size. These are the most common sizes you see on vacant land or in front of commercial properties that are for sale or for lease. They are usually large signs so that they can contain a lot of information about the property being leased or sold like lot size, zoning, available utilities, building information and of course, contact information about the realtor / broker listing the property. The signs are generally propped up by large 4″ x 4″ wood posts ( 2 posts for 4ft x 4ft and 3 posts for 4×6 and 4 x 8′s ). These signs are not cemented into the ground to avoid sign permit requirements as they would require a permit. Instead, holes are dug deep enough into the ground to support the sign and then removed when the property is sold or leased out. Cheap wood realtor signs cost around $125 for a 4ft x 4ft and around $225 for a 4ft x 8ft sign. The signs are full color and usually have a laminate on them to help guard against fading in the intense sun heat of Las Vegas. Generally, the wood signs are going to last 2 plus years with full sun exposure and much more if not placed in direct sunlight. June 26, 2018 Robert W.
Stand up signs will get your business noticed. Many businesses use these signs because they can contain a lot of information and take up precious little space. While the base ( width) is ales than 3 feet wide, they can be 7 feet tall, making them an impressive display. Best of all, they are free standing and require no support. Often, convenience stores will place these stand up signs near the exit so as to market impulse products as you go to the cashier to leave. Stand up signs are full color, meaning you can print as many colors on the graphic as you like and also can have pictures and logos on them as well. These stands are available at sign shops at very reasonable prices and only take a day or so to make. June 25, 2018 Robert W.
These three facilities alone account for more than 3 million square feet of floor space dedicated to conventions and trade shows. All facilities have been updated for the convenience of the vendors and attendees to state of the art facilitates. Hundreds of thousands of people attend these events yearly in Las Vegas. In fact, many attendees bring their families along with them as sort of a mini vacation. While the City of Las Vegas has been known primarily as a gambling center, most people do not know that Vegas is very family friendly. There are many things to occupy the kids time such as pools, arcades, theatres, water parks, etc. Cheap retractable banners are just that, inexpensive graphic displays that are easy to set up and take down and are self standing. The most popular size, the 33″ x 78″ tall stand offers a full color graphic, stand and easy carrying case for under $100.00 . These cheap retractable banners come in many sizes for under $100 and you can also buy the premium stands with the chrome bases for a little over the basic price. Also, these stands come in different widths that are almost 5 feet wide which makes for a very impressive display. By placing two of these stands next to each other, they build a banner wall that appears to be one solid graphic. These banner walls can be set up in just a few minutes and can be put away in under 5 minutes. 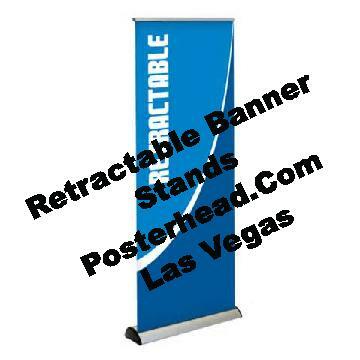 June 20, 2018 Robert W.
Stand up banner stands a favorite at events and shows in Las Vegas. 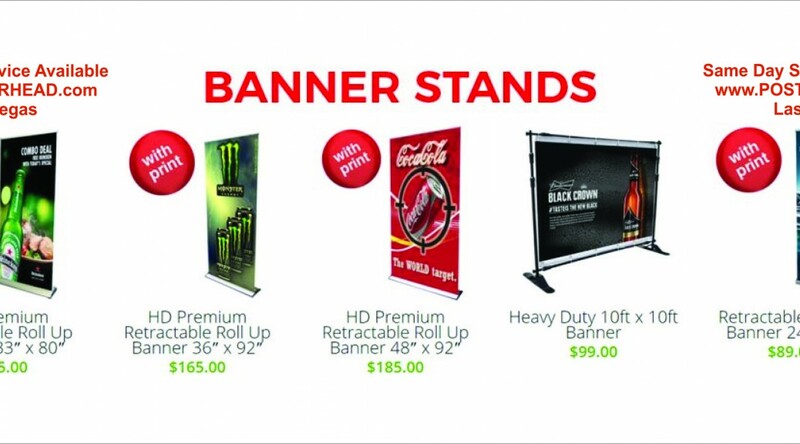 These economical banner stands are easy to set up and take down and allow for the graphics to be moved around. They are self standing and can be moved almost anywhere. More information can be learned at http://www.reliablecounter.com/blog/banner-stand-foam-board-signs/ . Stand up banner stands are cheap, the starting cost of these is less than $100 for many sizes, including the popular 33″ x 78″ model with the telescopic pole. These stand up stands come with printed graphic, stand and carrying bag. They usually can be made very quickly ( next day) and often the same day in cases of emergencies. Many times vendors come into town for the purpose of showing off their goods and services at one of the convention venues and find that they simply forgot their graphics back home or they were shipped improperly and need to have them replaced in the same day. Sign companies in Vegas come across this all the time and do their best to assist them in obtaining their graphics quickly in cases like this. These sign companies can be found close to the convention venues like Mandalay Bay Convention Center or Las Vegas Convention Center so that the graphics can be picked up or delivered quickly. Stand up banner stands come in many sizes to accommodate your display needs. ranging rom just a few feet wide all the way up to around five feet wide. Stand up banner stands can be printed in many colors and include pictures and logos as well for the same cost. If you find yourself in need of display graphics, contact one of the many sign companies in Las Vegas to assist you in getting them made locally, rather than having to bring them with you or ship them in. June 15, 2018 Robert W.
Las Vegas sign making can get you those badly needed signs and banners for your business or personal use. In these challenging economic times, businesses are using signs and banners to create business and have found it to be a cheaper way of getting to their potential customers. For example, why do newspaper advertising if you chop is on the west side of town and your clients are all local ? Smart businesses are capturing the same market share at a much lower rate by placing large banners on their premises that act as sort of a billboard to let all the cars see their banner displayed. More information can be obtained at https://www.funadvice.com/blog/las-vegas-is-a-fun-place-to-live-and-work-i-work-at-a-sign-company-and-i . Local businesses know that over the past several years, vehicle traffic has increased dramatically. Consequently, more vehicles are on the city streets than ever before. Smart businesses are taking advantage of this traffic by using banners, sidewalk sign and other forms of signage to get their marketing message across. Locally owned restaurants are using banners to advertise heir daily lunch or dinner specials for a week at a time and then just changing out the banner to reflect new specials. They keep the old banners and simply swap them out in rotation. Local restaurants are seeing a huge increase of the items they are advertising on these banners. At $2.00 a square foot, the banners are cheap compared to mail coupons or other forms of advertising. The same is true for sidewalk signs, they are simply placing these sidewalk signs on the sidewalks to attract attention and swap out the graphics routinely. Car magnets are also a great source of advertising as they are cheap and easy to install with minimal effort. Las Vegas sign making can get you more business at the right price. Contact a sig company today about the possibilities. 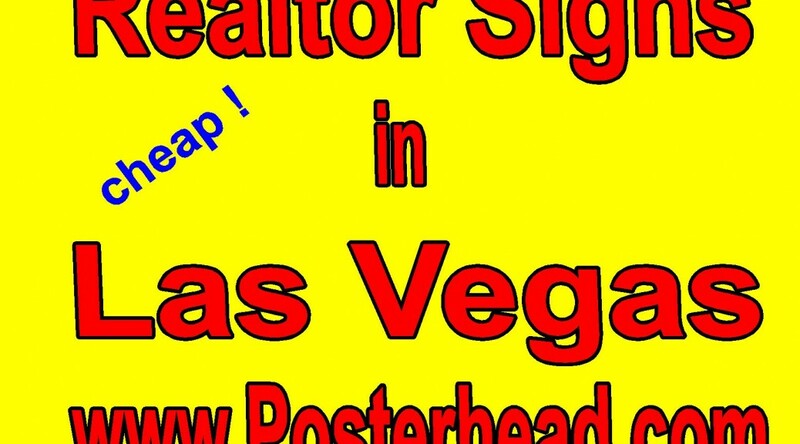 Cheap real estate yard signs are available in Las Vegas to GLVAR members. 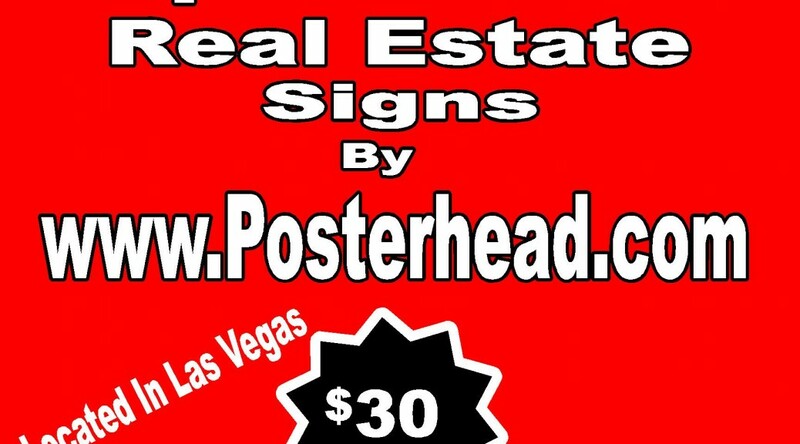 Companies like Posterhead Signs offer special deals to local real estate agents who are members of the GLVAR ( Greater Las Vegas Association of Realtors. More information about this company can be found at : https://www.topratedlocal.com/posterhead-signs-reviews. Cheap real estate yard signs are usually made with an aluminum substrate that is .040″ thick. They cost around $27.00 for a double sided sign or about $20 for a coroplast sign double sided. Both the aluminum and coroplast sign is printed on a vinyl material and then applied to the substrate of your choice. These signs are printed using eco solvent inks on large format printers. Eco solvent ink is the inks designed for outdoor use to prevent fading, which is especially important in Las Vegas because of the intense hot summer sun that breaks down most objects over time. Its common knowledge in Las Vegas that you can buy the most expensive car battery that is guaranteed for 7 years, but in Vegas it will only last maybe 3 summers. Real estate is a “Hot Market” in Vegas right now. Houses are selling in many cases the same day and receiving multiple offers. Buyers from plush California are trading in their homes and walking away with lots of cash and are finding out a simple house in California can get you a lot of house in Southern Nevada. The market is do good right now that people are offering more than the asking price, but the problem is that the houses will not appraise for that. Cheap real estate yards signs are easy to order and only take a few days to make. The signs will come laminated to help protect them against the heat and simple vandalism. Contact a local sign company today and order your cheap real estate yard signs. June 14, 2018 Robert W.
Affordable real estate signs are needed for the some 11,000 realtors in the Las Vegas area. Even though Las Vegas is a hotbed for real estate action, keeping costs down is important. An article on the subject was recently posted at https://goo.gl/99ChjY . According to the author, Californians are moving into the area and purchasing homes very quickly, many times offering more than the selling price. Offers are being made and accepted quickly and cash is being offered for the house and that allows for quick closings of escrows. In cases where properties are being sold quickly, is it necessary to even put up a realtor sign ? Many real estate professionals answer yes to that question because the real estate sign with their contact information and/or picture is being seen by neighbors and people driving by and that might convert to lead generation for a buyer or seller of a property. After all, if you sold a house on a street, people will think you are quite familiar with that neighborhood and might have additional buyers willing to purchase their homes. You not only can act as the buyer’s agent, but you could potentially end up representing the seller of the property. Affordable real estate signs are a blessing to the thousands of agents in the Las Vegas valley. The Greater Las Vegas Association of Realtors ( GLVAR) has teamed up with sign companies to get lower sign costs for their members. These sign companies offer discounts to GLVAR members for all signs purchased, even large commercial signs that are placed in front of vacant land or buildings. Affordable real estate signs can be found at sign shops in the local area. Simply contact them and ask if they are a Member benefit Partner with the GLVAR and get your discount on real estate signage.